Coneflowers (Echinacea) have become widely popular in recent years, although for a long time, they were nothing more than humble prairie flowers. With their large pinkish to purple flowers and long stems, coneflowers look charming in a cottage garden, xeriscaped bed or wildflower planting. The plants are hardy in U.S. Department of Agriculture plant hardiness zones 3 through 9, making them adaptable to almost every part of the country. They can be propagated from seed, cuttings or division and they require almost no care. The flowers attract butterflies and bees to the garden in the summer and offer shelter and food to wildlife in the winter. How many plants can you say that about? 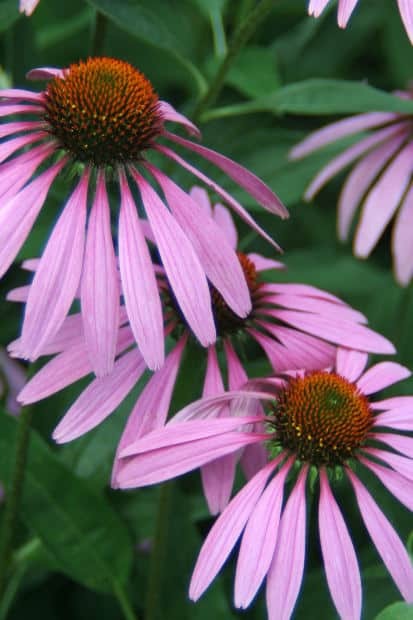 Coneflowers are widely available as nursery plants, but you can also plant them from seed. Sow them directly in the garden in late spring or start them indoors four weeks before the last frost. They germinate best when air temperatures range between 65 and 75 degrees Fahrenheit. Sow the seeds in a lightweight starting mix and cover them with a thin layer of the mix. Keep the soil evenly moist and transplant the young seedlings when they stand 3 inches tall. You can also propagate coneflowers by division. In fact, they become overcrowded and should be divided every three to four years. As prairie plants, coneflowers grow best in full sun, although they tolerate partial shade. They are quite drought tolerant once they become established, but water them at least weekly during the first growing season. They’re also known for tolerating poor soil. Although this is true, the plants will grow and flower better if given a loam soil with moderate fertility. They don’t tolerate heavy, soggy soils and will develop rot root diseases. Amend heavy soils with compost and peat moss or grow coneflowers in raised beds. Cut back the stems after flowering to encourage a tidy look, but leave a few over the winter for your animal friends. The plants will readily self –sow if you leave a few seed heads. Coneflowers don’t need a lot of fertilizer. Apply ¼ cup 10-10-10 fertilizer per plant in the spring. Coneflowers are fairly disease and pest resistant, but they are bothered by a few problems. In addition to root rots, powdery mildew is fairly common, but rarely fatal. Space the plants so air circulates freely between them and use soaker hoses instead of overhead sprinklers, which can spread disease. Aphids and leafhoppers are the most common insect pests. Both damage the plants by sucking the juices from the leaves and stems, causing the plants to wilt. Leafhoppers can also carry aster yellows, a serious plant disease. Wash these pests off with a steady stream of water or spray all parts of the plants with insecticidal soap or oil. Make applications on cool, cloudy days because these products can burn plants if applied during hot, sunny weather. “Magnus.” Named the 1998 Perennial Plant of the Year by the Perennial Plant Association, Magnus grows 3 feet tall and has wide, rose-hued blooms. For a compact variety, try “Kim’s Knee High,” which produces purple to pink flowers. “Tiki Torch” is a hybrid variety with orange petals. “White Swan” grows 3 feet tall and produces lovely white flowers. The sturdy stems make this an excellent cut flower. The Big Sky series is a group of hybrid selections that come in several colors. These plants do not tolerate wet, poor soils. Big Sky “Sunrise” produces yellow blooms; Big Sky “Summer Sky” has peach colored flowers with a rose halo near the center.